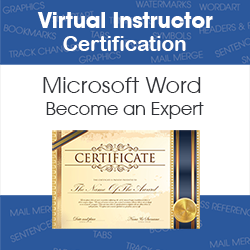 This certification program contains 26 video courses. These videos contain the same information covered in our LIVE, online, 1-hour, instructor-led classes. You will also be able to download the training guide along with any class files that are used in the video course. Once you've completed all the lessons in all six series, you'll have a final test that also requires a passing score of 80% or higher. You will also need to submit a final project that tests your knowledge of the various topics covered in the Word Certification program. You'll need a passing score of 80% or higher on the project as well in order to receive your Virtual Instructor Word Certification. We'll also show you shortcuts for applying tab settings to other areas in a document. You'll also learn the difference between character styles, paragraph styles, link styles, list styles, and table styles. You'll also learn how to add an organizational chart to your Word document. You'll also learn how to use the Compare Documents and Merge Documents commands.